Read through the entire warranty before placing your warranty repair order. By placing a repair order, you verify that you have read through and understand all of the terms and conditions below. PLEASE NOTE: The REPAIR for your chewed harness is a FREE service. Harnesses take an average of 5 to 6 weeks to ship back to you. The repair is for the harness ONLY. The leash is NOT covered under the warranty. Please do NOT mail the leash. OH NO!!!!! What Happened to my dog's Freedom No Pull Harness???? 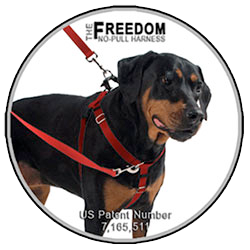 Unfortunately, Fido found a way to nibble and chew on the Freedom No Pull Harness. The most popular area for your beloved baby to chomp on are the straps located below their chin. I know it is frustrating because generally we never catch fluffy committing the act of chewing and it looks like the harness has torn or ripped. A chewed harness does not necessarily have bite marks. Rather it looks like a slice or cut. 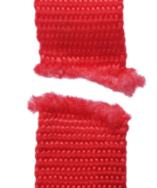 Not to worry....you can get up to (2) webbing straps repaired for FREE with just the cost of return shipping/handling. ALL harness automatically come with the FREE 2-strap chewing warranty. You only need to pay for the shipping if and when the harness becomes damaged. Any damage beyond the (2) straps is an additional charge. 1) Make sure the harness is properly fitted and not loose. 2) Use the harness during walking and training. Immediately remove and do not leave on your baby when not in use. Step 1: "Order" the repair below. Mail the chewed harness and the email confirmation receipt. We highly suggest you use either delivery confirmation or a signed delivery service and keep this information. Your harness can not be returned to you if we do not receive it. You must include the ENTIRE harness and ALL of the parts/hardware components of the harness. However, do NOT include the leash. There will be an additional charge for any parts or pieces missing. Please allow a minimum of 6 weeks to receive your repaired harness back. You will receive an email with shipping confirmation when the harness is mailed back to you. Questions????? Please contact us anytime by phone, (248) 321-5538 or email. Please note shipping is for USA Addresses ONLY. Shipping outside of the US is additional. You will receive up to (2) harness straps replaced for Free with only the cost of return shipping/handling ($6.99). The shipping/handling charge will appear upon checkout. Each webbing piece is considered (1) strap. If there is any fraying or marks on ANY strap or Buckle these items MUST be replaced. There will be an additional charge for anything over (2) straps or any buckles or hardware. If there are more than (2) straps chewed please include $5.00 per each additional strap. A maximum of (3) straps can be replaced. If there are over (3) straps this is considered beyond repair and a new harness will need to be purchased. Buckles are $5.00 per each chewed piece. There are a total of (4) buckle pieces on the harness. A maximum of (2) pieces will be replaced. Missing hardware is $4.00 per piece. **Please wash and line dry prior to shipping. A dirty harness will NOT be repaired and returned to you at your expense. Shipping outside of the US is NOT included. The leash in NOT included as part of the repair. You do not get to select which pieces of the harness will be repaired. If there any plastic parts or webbing straps that have been chewed they MUST be replaced. You are responsible for the cost of any plastic pieces or webbing straps (beyond 2) that are chewed. Type YES to indicate you that have read and agree to the terms and conditions of warranty repairs. Buyer beware that the rating shown on the purchase page does not seem accurate. With a high rating I would assume many people are happy with this warranty. I thought I only needed one strap replaced but they said the collar had many chewed places. I was not aware of this and apparently what USA Dog Shop considered damage was not the same as what I considered damage. I know they tried to make it clear in the repair policy but it was not clear to me. I just wasted the money on shipping it to them, so no big deal, but it seems better to not offer this or to provide pictures in the policy as to what USA Dog Shop considers damage. But the rating on the product sales page is what I feel is deceptive and I have a feeling no one will be able to read this review as the product rating claims to have no reviews on this warranty currently.